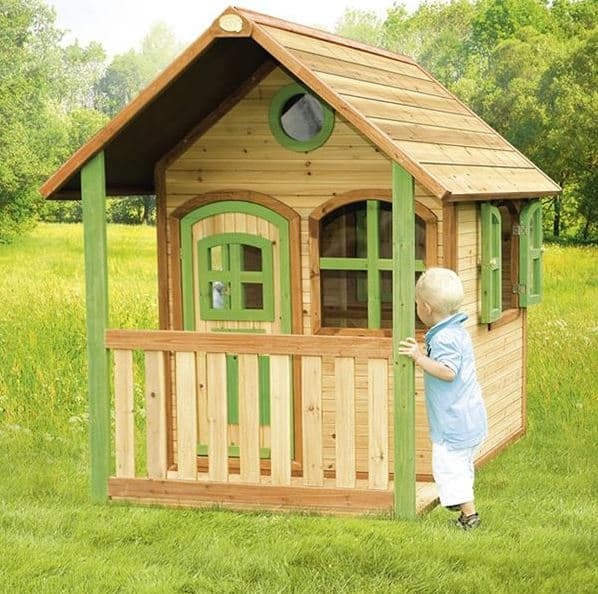 The 4 x 6 Alex Axi Playhouse is a lovely looking playhouse that can be enjoyed by both boys and girls. Little girls can have their friends over for a little Disney Princess tea party and the boys can have a fun discussion over who really is the best superhero. They really can let their imagination run wild in here and the generous amount of floor space means tables, chairs and lots of toys will be able to fit inside here. There is this splendid veranda that covers a little decking area so they can sit and enjoy the sun when the weathers good. If you have been looking for a way to get the kids to actually play outside and stop watching TV all day then this is a great way to do that. This is a very solid playhouse that is made to last for many years. There is this very chunky frame that sits behind the tongue and groove shiplap cladding to give it a very strong feel. This is not just a playhouse that is strong structurally, but all the extras such as the door and the windows have been made with kids in mind which means they will be safe as they play inside here. 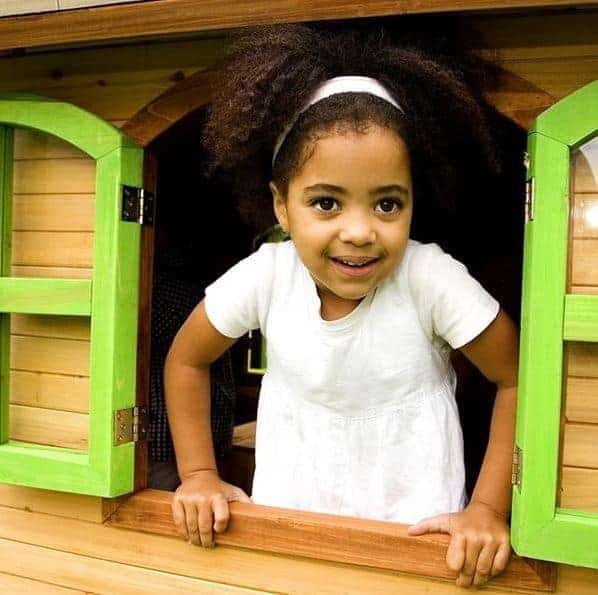 With its fantastic veranda roof and that tremendous little decking area how can you not just fall in love with the 4 x 6 Alex Axi Playhouse? 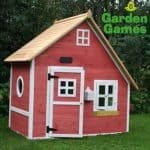 This has a very classic type of charm to it and in many ways its design is something of a throwback to the classic Wendy House style of playhouses. We really like what they have done here from a design point of view and while inside the playhouse there is roughly 4 feet of both width and depth, you also have a couple of extra feet of depth thanks to the decking area outside. 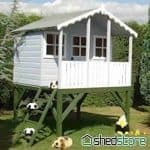 We feel that this is just the right amount of room for a playhouse as it gives the kids plenty of room to have fun, but at the same time it does not take up the whole of your garden. Headroom is probably the thing that surprised us the most about this playhouse. You can tell from the pictures that the apex roof is quite high, but the actual height of the peak is a very impressive, 5 feet 8 inches. Speaking of the roof, we really could not be any more thrilled with what Axi have done with this roof. It seems a forgone conclusion these days that a child’s playhouse will have some kind of felt roof, but rather than do what everyone else is doing, Axi have gone with a truly fantastic looking tongue and groove wooden roof. This is one very well made roof and you certainly have no worries about it ever leaking due to the apex design of it. The high quality cedar, 15 mm thick, tongue and groove shiplap cladding really does look nice. This type of timber has a very smooth and almost elegant look to it which we are sure the kids will not notice, but when you run your hand across it you are going to be very impressed at how strong it feels. Not only that it is put together so well that there really is no way for any rain to sneak its way into the playhouse. Axi themselves refer to the frame inside here as chunky and honestly, chunky really is the best way to describe this 38 mm thick, planed smooth frame. It really does make this a thick and sturdy structure that even if you have a couple of boys who like to practice their wrestling moves on each other, it is going to be able to deal with that kind of play. As you can see from the picture that decking area has a lovely floor. It is made with tongue and groove boards that are very strong and they also have a very appealing look to them. 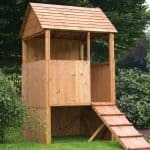 With a good wood floor inside, there really is no reason as to why the kids cannot load this playhouse up with just a ton of their toys. The 4 x 6 Alex Axi Playhouse will have a water based treatment before it is sent to you, but this is not meant for long term protection. You will need to give it a good coat yourself shortly after it has been built. It may sound like hard work, but giving a playhouse of this size a coating of wood treatment will not take that long at all. We always suggest giving it a fresh coat once a year, doing this will keep it rot free for the duration of its life. A five year warranty will take care of you in case there is any rot that starts to appear on the playhouse. If you treat it right though, you should never have to make use of this warranty. We really do love the design of this door and how it has just a very cute and attractive design. It is just the perfect height and width so that kids can get themselves and a whole lot of toys inside comfortably and easily. The door has a window on it so the kids can decide if they want to let whoever is knocking in. One very cool feature about this door is the little letterbox. We are sure it is going to be a lot of fun and very cute, watching the kids go and see if they have mail every day. There are another four windows on the playhouse to go with the one on the door and all of them including that one on the door is made with shatterproof acrylic. On the front we have a Georgian style fixed window next to the door and then close to the top of the playhouse there is a lovely little circle shaped window. Each side of the playhouse has a window that can be opened. These are just fantastic and close with a magnet mechanism that makes them close very securely, but they are also easy to open. We really hope that more manufacturers start to use these types of windows as they really are great. Surprisingly despite the lack of a lock on the door when the door is closed and the windows too this is one of the more secure playhouses we have seen. Most playhouses do not come with a lock as that tends to be more hassle than it is worth, but you still want it to be tightly closed and this one does exactly that. Just try to get the children into the habit of closing the windows and the door. Privacy is not something the kids will really be bothered about, but due to the decking area and the style of the windows this is not as easy to glance into as you would think, making it one of the more private playhouse we have looked at. Axi like most other playhouse manufacturers do not offer any way to customise the playhouse. However as it comes unpainted you can always get the brush out and give it a bit of your own style. Or if you are feeling really brave you could let the kids paint it! There are a number of extras available for this playhouse and some of them we must say are very interesting. To start with we have the solar kit which we know sounds like something from Star Trek and the technology behind this very well may be, but this is a little solar panel that goes on the roof and then provides a little bit of power to the playhouse. This can be added for £74.95. If you want to make sure the playhouse is not going to fly to the land of Oz if the wind is really bad, then for the price of £54.95 you can get an anchor kit. A flower box can be added so you can brighten the outside up a little bit this is done in the same style as the playhouse so it will go with it very well, you will need to pay an extra £34.95 to add this. 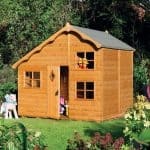 This is a chunky and well made playhouse and we are very pleased with the overall quality of this. With a coating of wood treatment just once a year, we see this lasting for many years, even with the kids abusing it along the way. Including that awesome decking area, the kids will have a lot of room to use. As an added bonus even though this will feel huge to the kids it is not going to take over your garden. 4-6 hours is what we would expect this to take as long as you have a friend who is willing to help build and get the kettle on. A little friendly advice we have for you is to try and build this without the help of the kids. 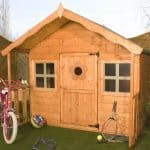 We really like this playhouse and with the veranda and decking area it really does look quite amazing. 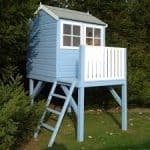 The price may be more than other similar sized playhouses, but we do still think the price is worth it. Final Thoughts: The 4 x 6 Alex Axi Playhouse is a very attractive playhouse where you kids are going to love to spend time. They can have friends over or just sit in there on their own bossing around their stuffed toys. 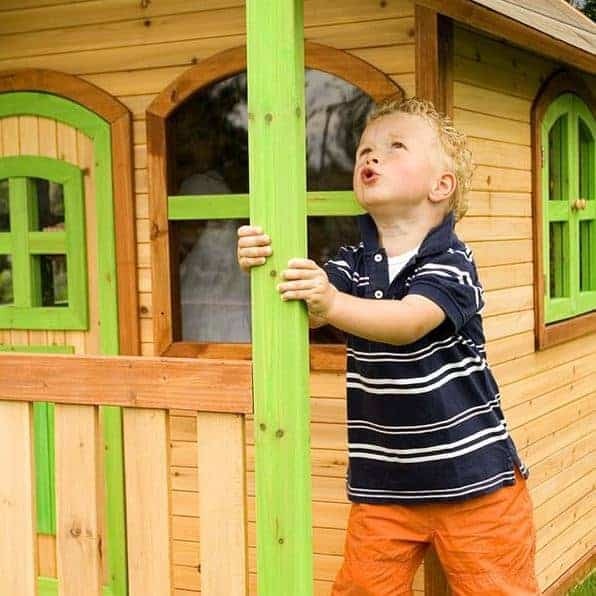 As well as being fun and easy on the eyes, we also love how strong this playhouse is. Thanks to the frame and the cladding, you will find that this stays standing strong for many years. 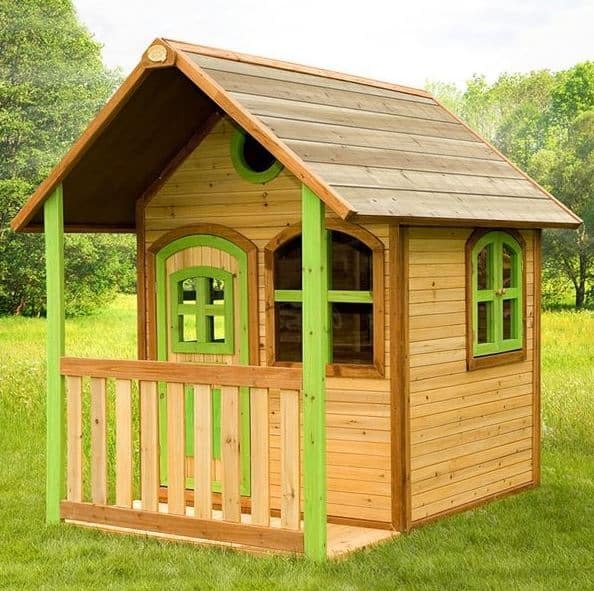 We know that there are many playhouses which are cheaper, but this one with its great look and robust design, we feel is worth paying that little bit extra money for.